It’s been a long time since the last Snapshot, but worry not! 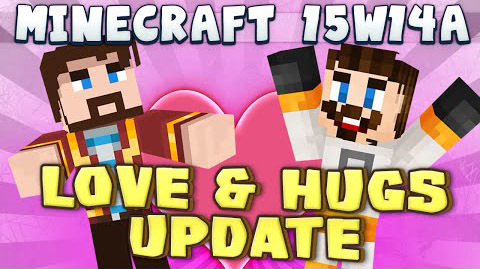 Snapshot Wednesday is back, and there are some exciting changes coming up for 1.9: the Love and Hugs Update! Famously, Minecraft has come under fire from a lot of directions in the last few years as a game that promotes, and even rewards, violence against animals, other people, and the environment itself. In an effort to make the game more family-friendly ? and by extension, more appealing to family advocate groups and government agencies ? Minecraft will be adding a ton of exciting new content. Let’s see what is on the table today! Added a new ?Love? meter. This fills up the more you help others, and others help you. ?Survival? mode has been renamed to ?Existence?. ?Monsters? are no longer named as such. The preferred term is ?Inhabitants?, as they live in this world just like you or me. Guardians have put aside the initial misunderstanding, and now welcome you into their home with arms? erm? eyes? wide open.